hi folks, i need to remove my steering wheel in order to access firewall footwell area and front floorpan without banging my head all the time. 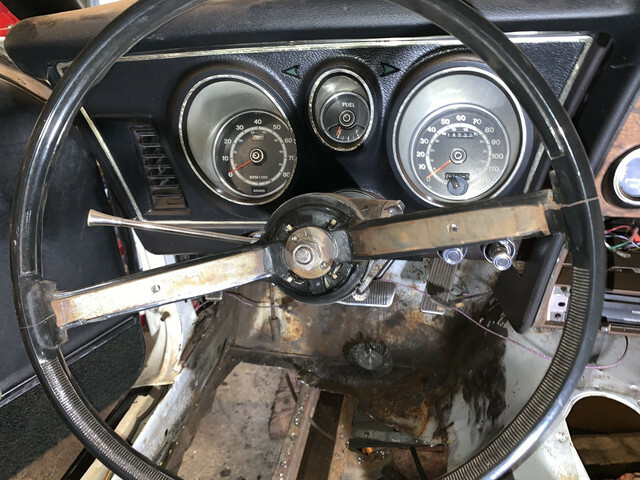 I need to order a puller at short notice in the UK so i can work on car this weekend, but i believe most pullers here come with metric thread bolts, does anyone know what threads are on the 71-72 Mustang steering wheels ? I can then cross reference with some potential pullers to see if they're suitable. Or even if you can show me a good puller available in the US and I can check to see suitability. thanks in advance. Going by memory, I believe they are fine thread 5/16". Most steering wheel pullers I have seen accept a variety of bolt sizes, and if they come without the correct size a trip to the hardware solves it. I assume inch-size bolts are readily available in the U.K.
You can upgrade to this type if you think you'll need to pull harmonic balancers, too. (04-15-2019, 05:29 PM)Don C Wrote: Going by memory, I believe they are fine thread 5/16". Most steering wheel pullers I have seen accept a variety of bolt sizes, and if they come without the correct size a trip to the hardware solves it. I assume inch-size bolts are readily available in the U.K. Yes they are available here, thanks for the quick response, this is helpful. I've found this one which I'll order now and should arrive by Wednesday. That will work, similar to one I added to my first post. I just bought one like that for my Safari (GM). Had a problem as the 180* bolt slots were too far apart and kept the bolts at an angle. Had to fudge it to make it work. The other type Don posted about should allow the bolts to be pretty close to the center screw and be vertical. Not sure if this is a problem with the Ford wheel. ok got it, thanks. i added Imperial to search and found the product. AF is the one I keep forgetting about. I've just received the puller, fingers x'd going down to the garage to see if its a quick job ! ok, took me all of 5 mins to remove, here are some pics to help others, thanks to all who responded, this is the best place to come to!